When Liz Mauritz and Zach Duarte create music together, they are the epitome of the yin and the yang. The skeletons of songs for their band, Gold Steps, start with each of them before bringing it to the rest of their band which consists of Elias Perez, Erasmo "Raz" Garcia and Roger Steadman. The skeleton of their latest EP, Incandescent, began in January of 2017 when the song “As Luck Would Have It” was written. It was immediately added to their set list but the idea of creating another EP was set to the side until June. They had also written a song called “Vacancies” which ended up being completely restructured later in the year. From there, they had written another song, “Suckerpunch”, but still hadn’t honed in on the direction or shape that it was taking. It wasn’t until one morning when Duarte woke up with an idea of a riff – which would end up being the opening track and first single, “Firestarter”. Mauritz took out lyrics she had written on her phone and worked it into the riff; it was the moment that they really felt like they had something special. “Exit the Apologist” came to them in August, followed by “Bright Side”. It became the most romantic track on the album as it was written for Duarte. Mauritz subconsciously interwove references of light, fire, brightness and sparks into each track, which she noticed after writing “Firestarter”. By the time October came around, which was when they were meant to start recording, they knew they needed one more track to round out the theme. As Duarte played a riff over and over, Mauritz recognized the theme of the other tracks and brought them together to create a medley that’s heard in the final track, “Manic to Panic”. One month later the recording process was finished and a few months after that they were holding the final version of Incandescent. “It refers to passion and brilliance and this EP is a measure of the passion and brilliance that we have inside of us for this journey that we’re on in Gold Steps and it also plays on all those literal references to light and fire,” Mauritz said of the EP title. From beginning to end, the brightness inside each track brings out the best in each member. 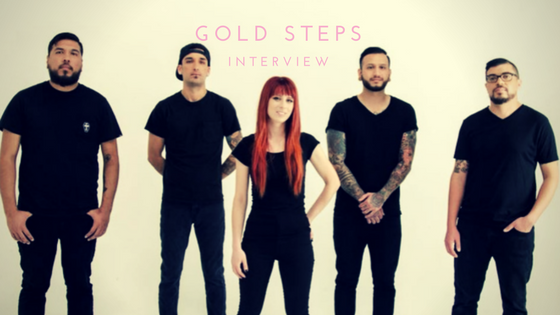 Gold Steps has grown individually and as a team, and their spark is far from fading.